According to various media reports, digital media companies Huffington Post and BuzzFeed are laying off staff as a result of falling online revenues. Cue much handwringing from the online media establishment, who are wondering if, as the Guardian puts it, the digital content bubble has burst. I don’t think it has. But I do think we are seeing a shakedown, and, to some extent, a maturing of the online content market. And there will be winners and losers from that. Back in the early days of the commercial web, the big buzzword was “SEO” – that is, Search Engine Optimisation. The aim was to be in the first page of results (and, ideally, the very first result) for a keyword search on Google et al. A lot of time and money was expended on that goal, and many fly-by-night companies sprang up to take advantage of the desire to be top of the rankings. You could pay for advice, or you could pay for SEO services that supposedly guaranteed top results for your website. Most of those were selling snake oil, but it still sold well. Phrases like PageRank Sculpting, Keyword Stuffing, Link Curation and so on will be familiar to any web developer who has lived through that era. There was a time when most of the commercial spam I received (that is, as opposed to adverts for mail-order brides and dubious pharmaceuticals) was promoting SEO services for my website. That’s mostly gone away now, and not just because my spam filters are better. Google took steps to kill off a lot of the black hat SEO techniques, such as link spamming and keyword stuffing, and that took down most of the shysters with it. Legitimate SEO still works, and legitimate SEO consultancies still exist. But, of course, legitimate organisations aren’t spamming you either. Another reason it went away, though, is because of the rise of social media and its importance in driving traffic to websites. You can’t SEO your way to getting lots of traffic from Facebook and Twitter; you have to develop other techniques. The big buzzword in the new social media ecosystem is “viral”. The aim is to make content (or, more accurately, a headline) so compelling that people will share it across the networks and you will get traffic as a result of people clicking the links. For a while, that worked very well. BuzzFeed and HuffPost built their business models around it, as did many other online outlets. And, like black hat SEO, the new world of social media spawned the dark underside of “clickbait” – shareable links designed solely to drive traffic (which could then be monetised via adverts) rather than accurately reflecting the content they led to. Clickbait worked very well, too. Too well, in fact. Not only does it drive traffic to the likes of BuzzFeed, but it also makes it easy to share undesirable content. There’s nothing particularly objectionable about listicles or pictures of kittens. But the same techniques also facilitate the spread of conspiracy theories, fad marketing and fake news as well as more sinister content such as terrorism and extremism-related material. And while it may be debatable how much of a real problem the latter really is, its mere existence is a reason for governments, campaigners, regulatory authorities and the social media companies themselves to take a long, hard look at what they are facilitating. And what they’re seeing is a bit ugly. There’s a lot of stuff out there that really isn’t nice. And that realisation has coincided with the data scandals of the likes of Cambridge Analytica. It’s beginning to sink in that making it too easy to share is not necessarily a good thing. And they’re beginning to do something about it. Facebook has already made it harder for content to go viral. In part, that’s to protect Facebook’s own advertising revenue – viral content is free advertising, and they don’t want that. But it’s also aimed at making it harder for undesirable content to spread. Recently, WhatsApp changed their forwarding settings to combat fake news. But these changes have also affected legitimate sources of viral content. Such as the aforementioned HuffPost and Buzzfeed. Put simply, if the clickbait isn’t baiting, the traffic isn’t coming. And ad-supported websites live or die by their visitor numbers. So, does this mean that the digital content bubble has burst? I don’t think so, because there is still a lot of content out there that is both valuable to readers and generates valuable revenue. But the content generators that have hitched their wagons to social media will suffer. One of the reasons for going down the viral marketing route in the first place was to have a foothold inside the social media walled gardens. For a lot of people, Facebook, Twitter, Instagram etc are the Internet. They rarely visit other websites at all, except when following a link from one of those sites. So to get the traffic, you have to be there. You can’t rely on people seeking you out via Google or Bing. But technology doesn’t stand still. Over half of all web traffic is now on mobile devices. And these devices themselves act as intermediaries to content. People are increasingly likely to find content by yelling “Hey, Siri” or “OK, Google” at their tablet or phone. But these digital assistants are just search engines. “OK Google” pretty obviously is; if you use it then you end up at a Google web page. But so is Siri. Apart from the things that Siri can answer directly, the rest is just web links. And those links are powered by – you guessed it – a search engine. The problem for the likes of BuzzFeed is that, while people will ask Siri “What’s the weather going to be like tomorrow?” or “Are there any good Chinese takeaways in Lower-Witton-on-the-Marsh?”, they don’t tend to say things like “Siri, show me 18 people who are having an immeasurably worse day than me”, or ask Google for “27 Hilarious Food Tweets By Parents Who Are At Their Absolute Wits’ End” (these are actual BuzzFeed headlines, by the way). Both of those return the same website as the first result for that question (as, indeed, they should – it’s my website, and I’m good at SEO). But they return different pages from it. 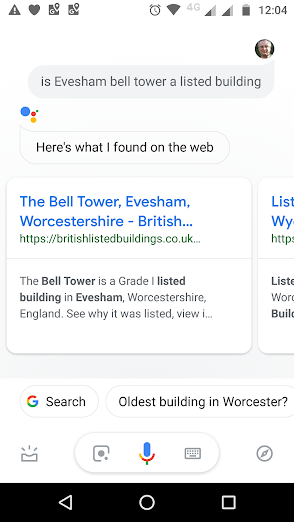 It’s interesting, too, that Google has spelled “bell tower” as two words, while Siri writes it as “belltower”. And that, I think, answers the question “What happens next?” in the digital content world. SEO is back, in a big way, and bigger than viral marketing. But it’s SEO built around spoken commands to a digital assistant as well as typed into a web form. And that will come with its own challenges. The first of those challenges is that people use digital assistants differently to how they use a web form. They speak to Siri like they would anyone else, in full sentences. 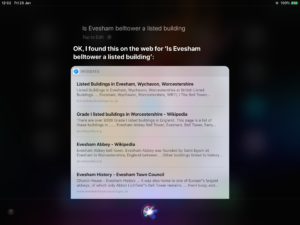 If I was making the same query on the web, I’d just type “Evesham bell tower listed building”, without the spurious (for search purposes) “is” and “a”. Fine-tuning SEO for natural language queries, rather than targetting web-based keyword queries, will be important when it comes to making Siri your friend. The other is illustrated by my two screenshots. Different speech recognition engines will convert your speech into different text. 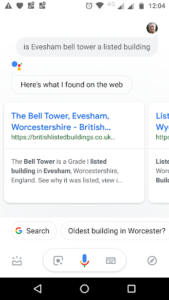 There may not be a huge difference between “bell tower” and “belltower”, but there are circumstances where it will have a significant effect on how the query is interpreted, and hence answered. Spoken word SEO will need to take account of that, and particularly so given that, while Google still overwhelmingly dominates the web search market, Siri is the leading digital assistant – and, by default, Siri searches the web using Bing. So a lot of the old SEO tricks that target the quirks of one specific search engine will be outmoded. More generic and cross-platform techniques will be necessary. So the digital content bubble hasn’t burst. But the successful digital content of the future will be mobile-friendly, amenable to natural language searches and not targetted at users of any one search engine or platform. And if that means the end of clickbait, that won’t be an altogether bad thing.